This article considers three "Local Posts" active during the George VI period : Lundy Island, Herm Island, and Shuna Island. These were private concerns that forwarded mail between their islands and the mainland postal administration stream. The local posts issued "carriage stamps" indicating payment of the forwarding service. 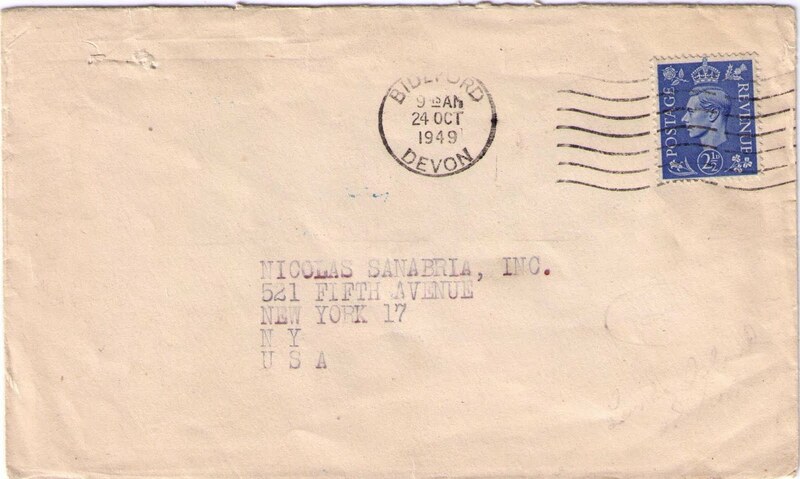 Although philatelically inspired, the covers are interesting postal artifacts. Lundy Island is a small island located in the Bristol Channel between England and Wales, twelve miles from the coast of Devon. In the late 1960s, Lundy was given to the National Trust. 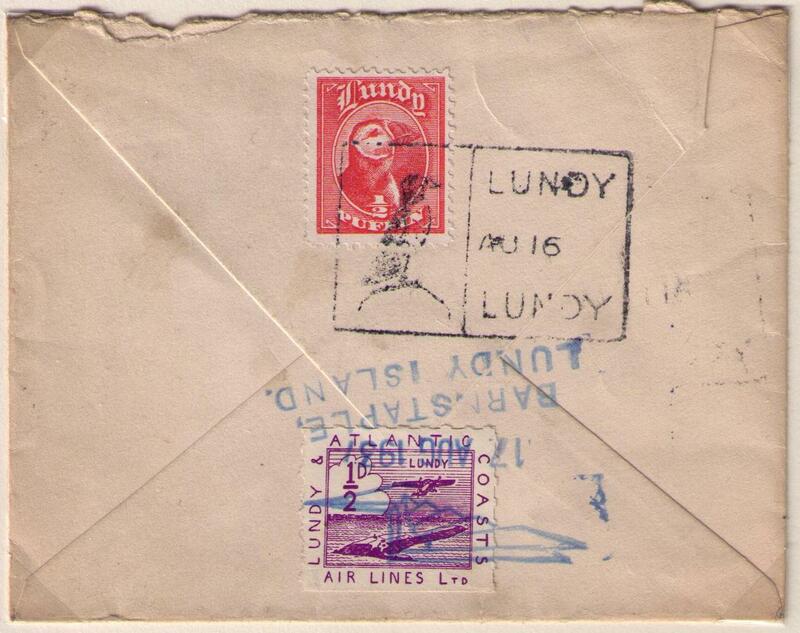 Lundy stamps had to be affixed to the back of the envelopes. Lundy and Atlantic Coast Air Lines Ltd.
Air mail service was provided between Lundy and Barnstaple via the Lundy and Atlantic Coast Air Lines Ltd. (LACAL) from the Barnstaple and North Devon Aerodrome. 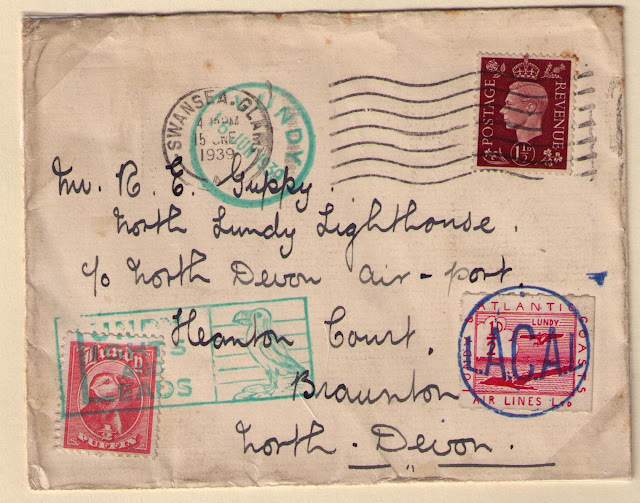 The letter was flown from Lundy and entered the British mail stream at Braunton, August 17, 1937, for transmission to Carmarthen. The aerodrome closed in the spring of 1940. An airfield for the RAF was built adjacent to the aerodrome. The above letter was mailed from Lundy to Chattanooga, Tennessee, June 12, 1940. 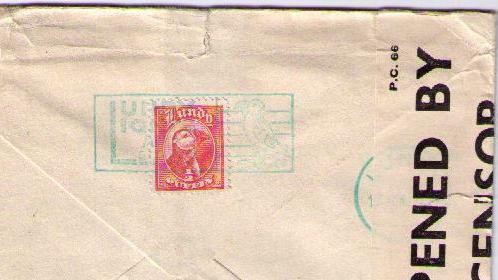 A Lundy "1/2 puffin" stamp was affixed to the back of the envelope. 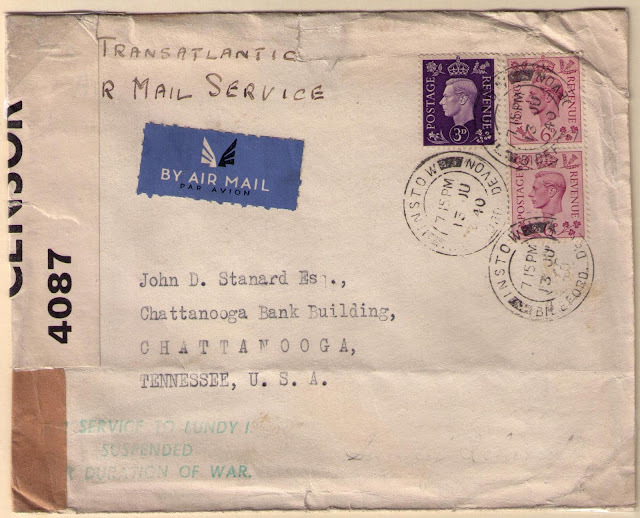 The letter was flown from Lundy and entered the British mail stream at Instow, Bideford, June 13, 1940, for transmission to the United States. AIR SERVICE TO LUNDY I. The above letter was mailed from Lundy to New York. A Lundy "1/2 puffin" stamp was affixed to the back of the envelope and cancelled October 23, 1949. 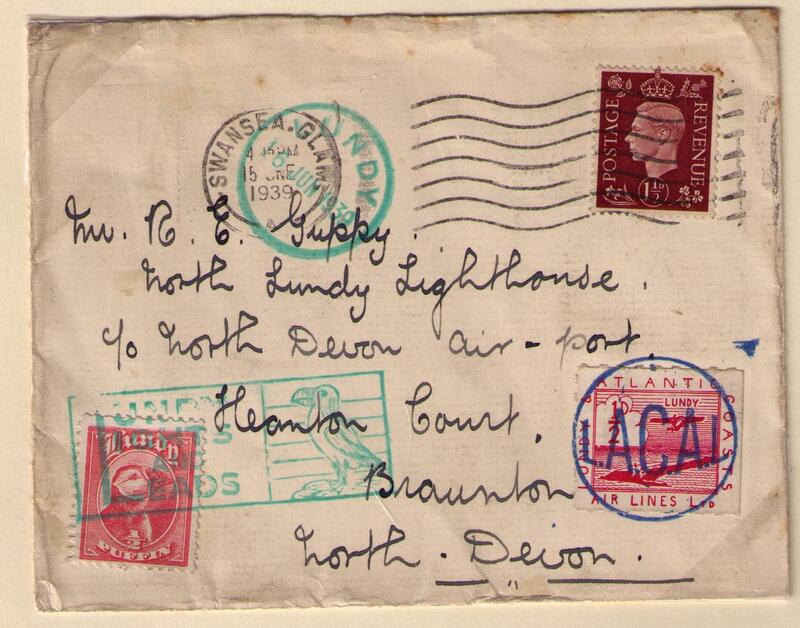 The letter was transported from Lundy and entered the British mail stream at Bideford, October 24, 1949. 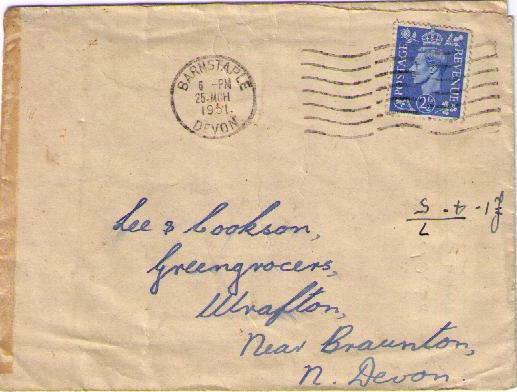 The letter above was addressed to Lee & Cookson, Greengrocers, Wrafton (Near Barnstaple). 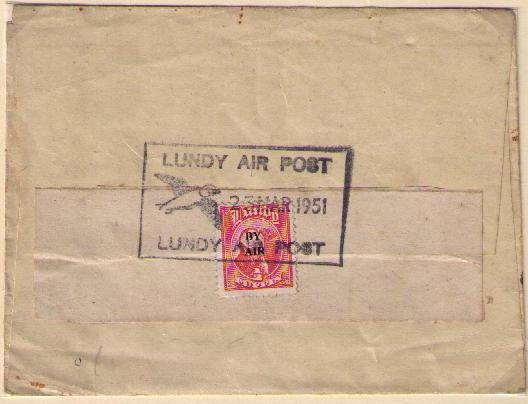 Lundy Air Post cancellation March 23, 1951. The letter entered the mailstream from Lundy at Barnstaple, March 25, 1951. 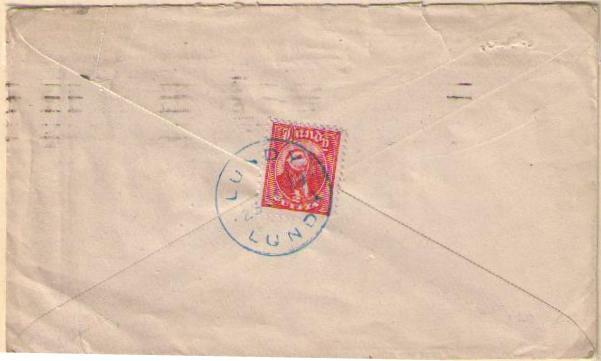 Lundy stamps could be affixed to the front of the envelope. c/o Aerodrome, Braunton, N. Devon. 1/2 Puffin (1/2d.) Lundy local label affixed and cancelled at Lundy June 26, 1938. The cover below to Lundy was carried by the SS Lerina. Lundy packets faced a difficult challenge. They worked from mainland ports with substantial tidal rise and fall to service an island with no permanent landing facilities (until 1999). 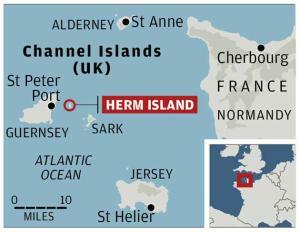 Herm Island is one of the Channel Islands, 3 miles east of Guernsey. Herm Island postal service was started by tenant Major Wood in 1949. 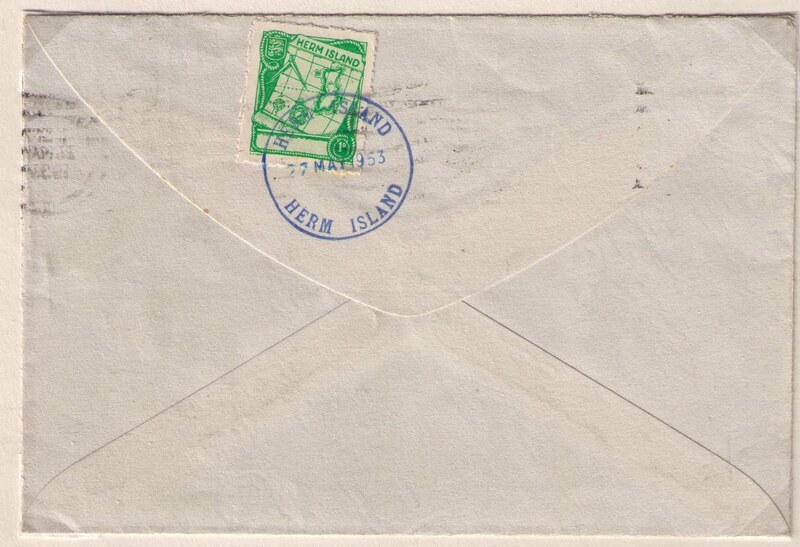 Herm Island stamps had to be affixed to the backs of outbound letters. 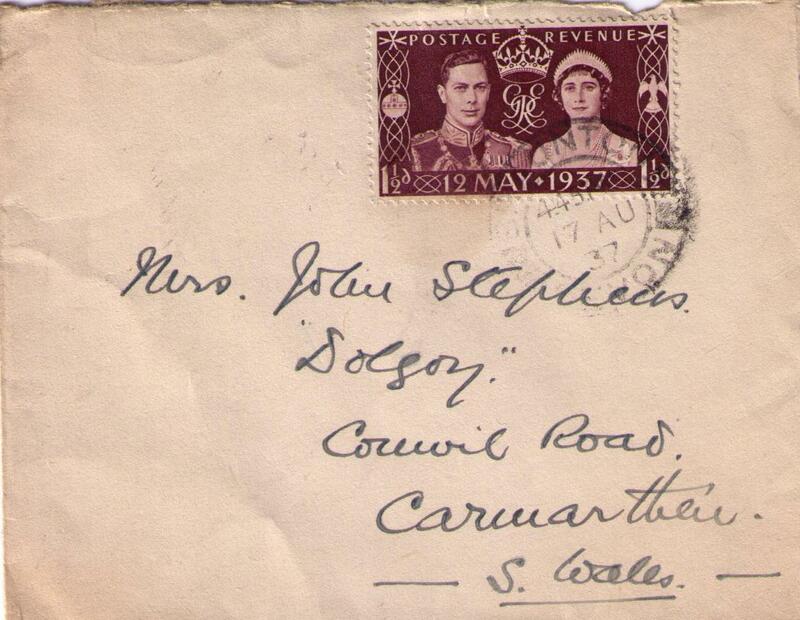 In 1969, Guernsey began issuing its own postage stamps. 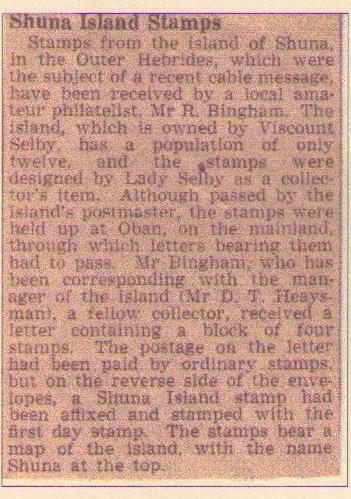 A post office opened on Herm Island and local stamps were withdrawn. 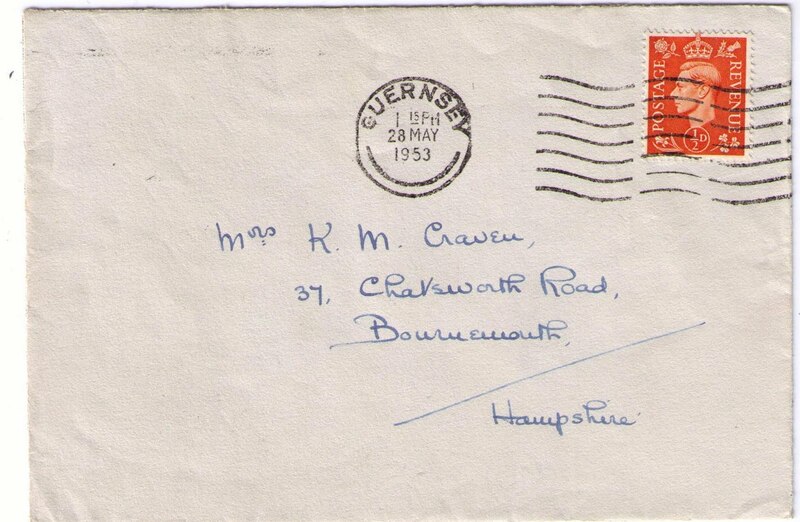 The cover shown below was mailed from Herm Island to Bournemouth on May 27, 1953. The Herm Island stamp was affixed to the back of the envelope. The letter was carried from Herm Island and entered the British mail stream at Guernsey where the stamp was cancelled on May 28, 1953, for transmission to Bournemouth. 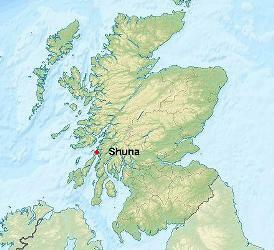 Shuna Island, located in the Scottish Inner Hebrides, is 20 miles south of Oban. In 1949, The island was owned by Viscount Selby (Gully family) and had a population of twelve. 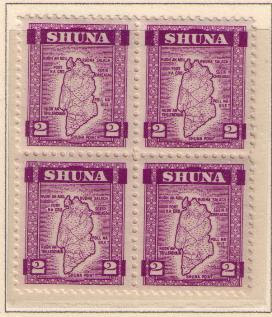 The Shuna Island stamp was designed by Lady Selby and issued on October 11, 1949. 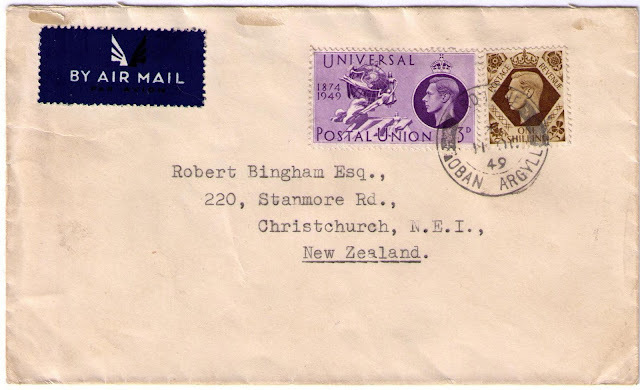 The stamps and cover shown below were the subject of a New Zealand newspaper article. 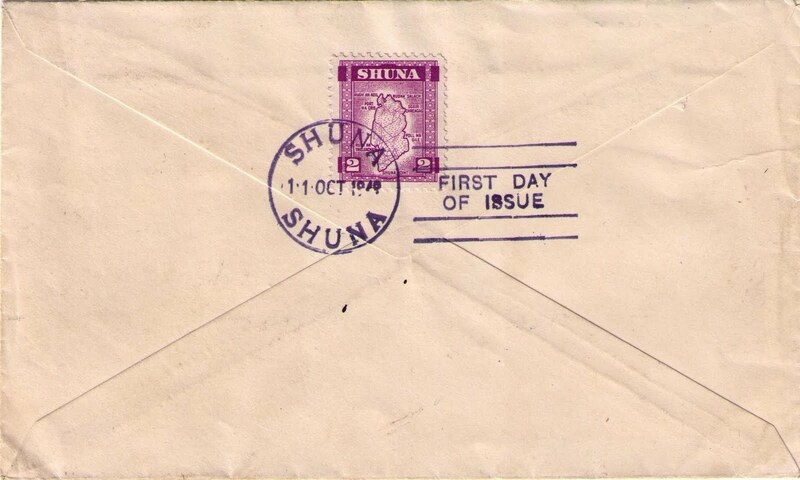 October 11, 1949, first day of issue of Shuna stamp. The Shauna stamp was affixed to the back of the envelope which was addressed to Christchurch, New Zealand. 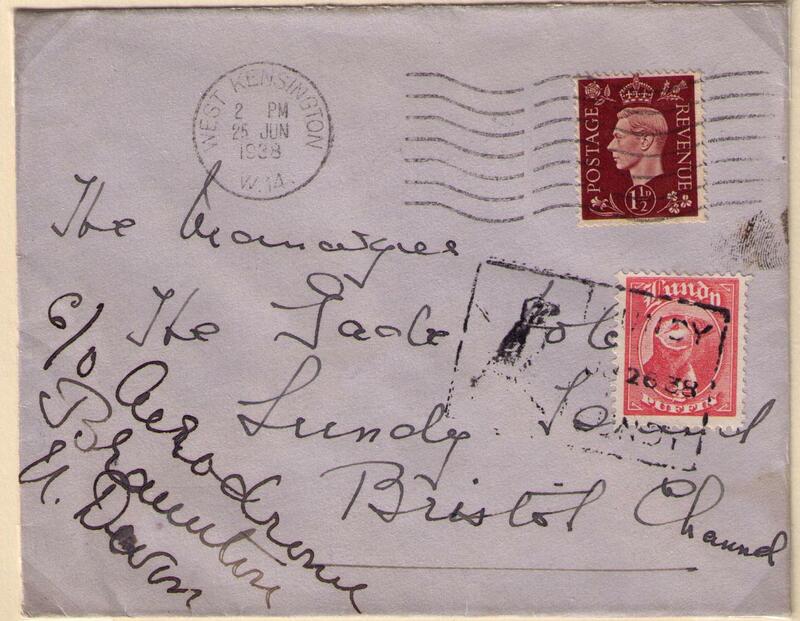 The letter was carried from Shuna and entered the British mail stream at Oban where the stamps were cancelled on Ocotber 11, 1949.